„15 years ago, we decided to make this event a true area for encounters and discussions between members of the public and professionals to whom we pay tribute. This approach now finds a constantly growing echo. At each edition, you have come in large numbers to attend the various get-togethers of this festival week dedicated to free information. This enforces our need to enrich our programming and adapt our welcome structures. This year, the Bayeux-Calvados Award is pursuing its opening to the public, and extends the reception capacity of its evenings to 1,500 spectators. 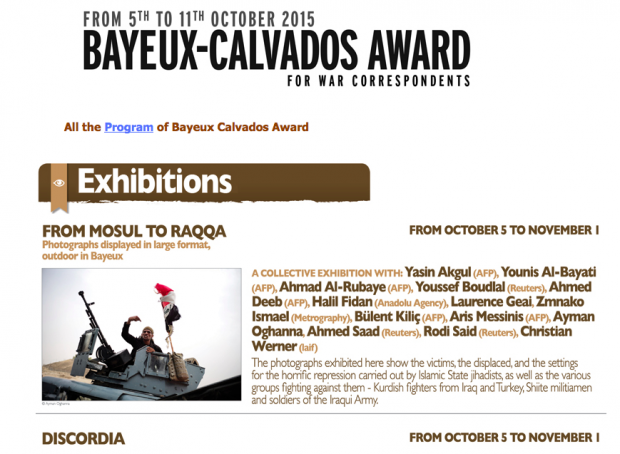 what the Bayeux-Calvados Award of war correspondents is inviting you to. This year, among the 350 journalists in attendance, the members of the international jury will work under the presidency of Carlotta Gall whose pleasure it is to accept this fine responsibility. Alongside, we wish to continue a true education for the media and raising awareness of international news in a wide section of the public, young people especially. Exhibitions in the entire city, encounters with journalists, prizes for school pupils, 15-year old youngsters, discussion evenings, book fair, documentary shows, action in the neighbourhoods, etc. These encounters are open to all, and contribute each year to achieving this undeniable goal. The commitment of ever-loyal partners, particularly this year of the Basse-Normandie Region, enables us to continue this essential and dynamic openness. Mehr Infos unter prixbayeux.org. und auf Facebook.